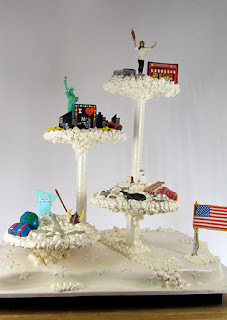 The Talking Box: Cake Boss: The Next Great Baker: Congratulations, Marissa! Cake Boss: The Next Great Baker: Congratulations, Marissa! Then, Buddy takes the group to the baking room, telling them that they're going to run the bakery for a day. [strikingly similar to what happened at the end of the first season, but less pastries and no theme cake.] Each contestant needs to make a variety of desserts to fill the showcases, then sell them. They get 8 hours to fill the cases with at least 400 cookies, 20 pies, 20 cakes, and 100 pastries. Cakes are sold for ten tickets, pies for five, pastries for three, and cookies for two. In one hour, the baker with the most tickets wins, and the baker with the least goes home. Nadine - She's planning to make coconut macaroons, chocolate-almond biscotti, chocolate chip cookies, lemon raspberry cake, chocolate mousse cake, pumpkin and turtle pies, and cream puffs. [why are cream puffs the go-to pastry for everyone? I mean, I get that they're pretty easy, but there are so many other pastries that are ten times as delicious!] Grace's inexperience baking is definitely a bit of an issue for the team, but they overall move along okay. [wow... measuring eggs in quarts?? geez.] When Buddy and Mary coem to do taste-tests, they say that the macaroons are good, the biscotti is too salty, the chocolate chip cookies are good, and the chocolate mousse was good. Later that morning, they run out of whipped cream shortly before time is up. As the selling winds down, they have a pan of cookies and cream puffs left. Nadine sells the most, earning 1,467 tickets. Ryan - He plans to make sugar cookies (in the shapes of footballs and balloons), chocolate chip cookies, cranberry biscotti, chocolate-peanut butter mint pie, chocolate mousse pie, vanilla cake, and chocolate cake. [we don't really hear mention of what his pastry is, and I didn't see anything in the showcase - anyone catch what it might have been?] Between Madeline not have a lot of baking experience and constant butting-of-heads with Anthony, Ryan is off to a slow start. On the first round of chocolate chip cookies, something goes wrong with when he added the sugar or something, so Ryan tells him to do it over again. Unfortunately, Anthony the Helper screws things up next, using Nadine's team's cookie dough instead! [that whole situation was a bit fishy... what was the dough doing on the wrong side of the room anyway?] Then, they have a problem with the buttercream recipe... the butter didn't cream or something, and Ryan tells Anthony that it must have been too cold. [I hate working with butter sometimes, I get impatient and microwave it, LoL.] 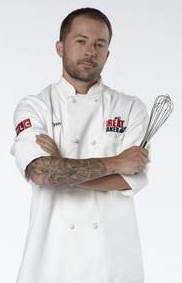 Anthony claims that the recipe must have been wrong, and Ryan begins to think that he knows more than Anthony. Elimination Challenge: At 2:30 in the morning, Marissa is happy that Nadine is her final competitor, as she'd be happy if Nadine beat her. Buddy says that the challenge is to make a cake that brings out a personalized American Dream. 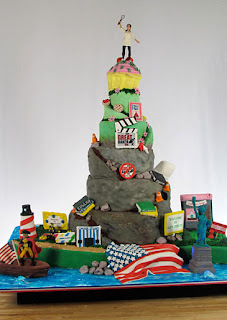 The cake needs to be 4 feet tall, and they have ten hours to do it. They are able to pick their team from some of the Carlo's staff, and they alternate, starting with Nadine, since she earned more tickets. Nadine starts with Mauro, then Marissa picks Ralph. [solid starts!] Nadine picks Juan and Marissa picks Frankie. [I wonder if Nadine went with Juan purely to ensure that she'd get a sculptor and that Marissa wouldn't take two of them. Otherwise, what's the point in picking the remaining sculptor when you could have first crack at the girls?] Nadine picks Liz, Marissa picks Sunshine, Nadine picks Rachel, and Marissa gets Kerry. [I didn't really recognize Kerry. anyone else?] The judging ends up taking place in a large auditorium, where the girls' family and friends are gathered, plus the other contestants (including Wesley). The judges are Buddy, Mary, and Randy Renoli (a fashion director from Say Yes to the Dress). And, yes, Buddy mentioned that a third season is likely, so head on over to tlc.com if you think you have what it takes!